Methodologically, these claims are intended to be backed up by  clinical findings in biology,  history, the history of religion and the history of philosophy,  neuroscience (p.8). The readings are hard to gauge. Most scholars in the humanities are unable to assess the science about pheromones, hormonal entrainment, crowd behavior, maladaptive behavior, olfaction, fetal emergence. I’d also mention that the occasional reference to rabbinic ideas are odd insofar as they are unrecognizable, almost impossible to identify with any degree of certainty. And the presentation of modern (Cartesian and post-Cartesian) philosophy seems one-sided and tendentious. More persuasive is Brennan’s model of reason and reasoning that require sensing and discernment (what Robert Brandom would call while evaluating differently the relationship between sapience and sentience). The discernment called for encourages a subject who sifts named feeling out of still vaguely sensed affects through attention, love, analyzing, sensing, and words (p.139). The education of the sense is supposed to lend itself to a re-alignment of body and mind. The felicity of that realigning is temporally paced in terms of speed. Images –the visual image and the self-image in particular– are criticized for blocking up and slowing down what should be fast neural connections that we are intended by Brennan to trust. The visual image is said to trap the energy fixed in its frame. Confronted by the image, we slow down to look and to ask, is this real or this not real (pp.148-50)? Instead, the author commits herself and her reader to an end run around the image, fantasy, repression, and blocked human subjectivity. But this end run depends upon an image or fantasy of her own making, i.e. the picture of a pure corporeal logic, quick and unimpeded. Language and understanding are reconnected into fleshy and environmental codes, assuming that once upon a time the human creature enjoyed a prior unity of linguistic, sensitive, and affective registers. 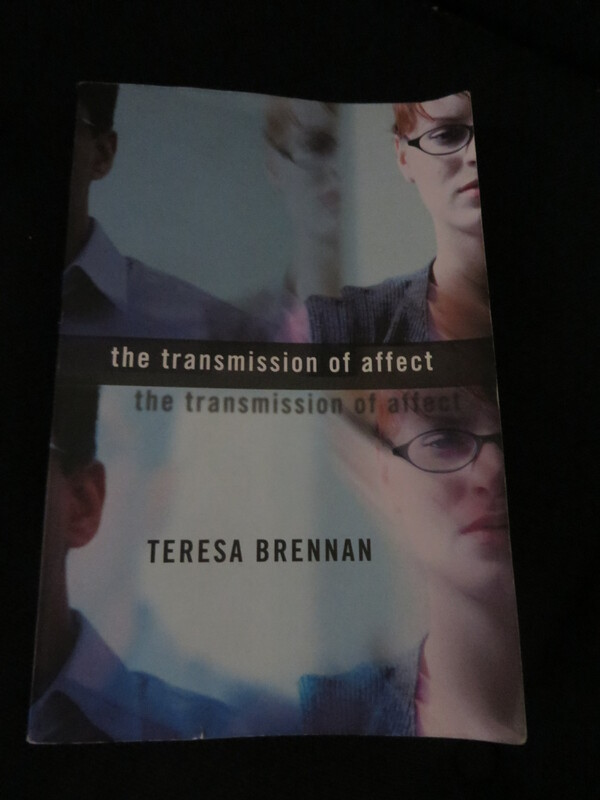 The transmission of affect is, in a certain way, an anti-modern and restorative project, which would make sense of the regular reference to (vaguely determined) Christian and East Asian ascetic and mystical beliefs and traditions. Is this a crypto-spiritual project? She never quite sells it straight out, but what I suspect Brennan is pitching is nothing less than immortality. Throughout The Transmission of Affect, pay attention to the word-constellations that combine appeals to “freedom,” “unburdening,” “unlocking,” and “reuniting” (cf. p.113). This is a Stoic morality (named clearly as such), the aim of which is “freedom from possession by the negative affects” (p.118). By breaking the hold of negative affect, what is promised is the release of more life, more freedom, more intelligence, more energy (pp.148-9, 158). In Brennan’s most speculative assertion, “immortality” is presented as “a starting point” for that “correct realignment of “flesh” and “language” as “transformation.” (p.149). In the “scenario” she sets, the “orders of the flesh…have become mortal” only “because they are obstructed by something slows them down” (p.147). “The problem” for Brennan is “the disjunction” between infinity (i.e. the infinite structure of the signifying chain) and “the finite concerns of neurotic subject, who are worried about birth and dead and their meaning in the scheme of things” (p.147). Brennan writes with verve and brio, but is she careless? As for my own final take on that race towards immortal life, I remain stuck in a position of basic sympathy for the problematic disjunctions faced by those so-called neurotic human beings who worry about birth and the death in the great scheme of things. In this, I’m holding out for a little bit of slowness against the strains drawn from Deleuze and Spinoza upon whom Brennan’s model of Affect Theory relies. This entry was posted in uncategorized and tagged affect, religion. Bookmark the permalink. Too bad it’s called “affect theory” — as if our receptivities to the world and others were either affective or cognitive. The presence of things speaks (fear in the room) but often in terms that are badly construed as affective: the glory of a hawk, the lilt of a river, the sparkle of an eye. We have sensitive access to presences that sometimes but not always arrive as affect. But i think that’s what they mean by affect. not emotions per se, but the more generalizable and dual capacity to affect human and non-human others and to be affected by them. Ah ! A thunderclap will move me, affect me, and isn’t an emotion. Is it an affect to theorize? A gesture of disgust will affect me and the gesture isn’t an emotion. Is it an affect? I’m trying to get a sense of the terrain. Mr Mooney: I think a modified version of Peirce’s distinction between emotions and affects might be useful here, where an affect can be the ‘stuff’ of an emotion, but can also be viewed as disconnected, independent, and therefore without an effect. So, an affect can just sit there, without being felt (so our emotions don’t need to be the limit of affects, just what happens when an affect changes our behaviour). So, we can have an affect that doesn’t (necessarily) have an effect: like a creepy room, with no one in it. Once it’s dragged into a relationship, the affect itself changes. Dustin, this is helpful. I had no idea Pierce wrote on affect and emotion. Could you say where? He seems right on target. not so far from Heidegger on moods, if folks like this sort of thing check out Dreyfus and Kelly on All Things Shining. Peirce is annoying here because he never holds the thread long enough, and so I have patched together a few things to come up with this reading. And, Peirce constantly changes his terms. So it’s also a question of how many transformations you are willing to go with. As a non-historian, I’m willing to go further than most, so I think you can argue that what Peirce calls the firstness of a feeling (the part that is what it is, independent of anything else, and therefore in an almost ‘virtual’ manner) is what we now call affect. If you’re willing to say this, then he opens up a wealth of what is now called ‘affect theory’. He also vacillates between calling the same thing an affect, and a feeling. Emotion he keeps separate, because an emotion is a kind of ‘movement’ (1.250, etc) but I would start with the above, and see if you think it’s worth pursuing. I think it is all ramblings of a conscience that is not even self aware. The conscience is, does, and perceives thing we cannot ignore or explain. We call it gut feeling, intuition, clairvoyant, connection. The conscience is where we perceive awe and wonder, but we don’t know what it is. Kant couldn’t. People working on Artificial intelligence cannot create an artificial ethical conscience. We know we have it, what it does, thats all. the “transmission” aspect is just nonsense taken literally/scientifically, there are for me some interesting possibilities in the phenomenology of feeling as-if this was something im-personal/not-me at work (in the air if you will) and than perhaps something along the lines of Isabelle Stengers’ work on mesmerism/interests/rhetoric, her book on/against Freud is well worth a look. well i think there is some value to trying to understand how things are meant/author-ized and than something else in what we might make of it (even despite/against such intentions/reason-ings) so yes complete non-sense (not a thing/power/energy/etc) that can be transmitted (just as “concepts” cannot) and yet open to other uses. Fear can be contagious, as can good cheer. It’s sensible to say their presence is transmitted. A painting transmits something to viewers, and Hitler transmits disgust. you can react to fear with fear but you can’t literally catch fear (and not a thing in the world, or a force of physics, to be transmitted), as for what we make of the physical attributes of a painting this too is an action (a response-ability if you will) on our parts (see Alva Noe’s new book). i’m not sure why you can’t absorb another’s fear or ambient fear. Is this just about getting the language right? And how different is this kind of extended notion of subjectivity radically unlike Noe’s extended mind theory (apart from philosophical precision)? by what means (physiology/etc) would you literally absorb another’s fear (and what is “fear” apart from their related doings)? it’s not like absorbing say body heat, my way of taking/making this is in line with extended-mindings like Andy Clark, my only major difference with Noe is that he thinks we come to grasp more of objects (say a painting) with new skills while I think we just come to put it to new uses (in new assemblages/collages). Of course we respond and act — we startle as the heavens transmit a bolt of lightening, and run for cover. Or we create a new assemblage (a doing) upon being struck by the allure of new parts to assemble, and upon being struck by new possibilities of assemblage. Without receptivity to perceptual prompts (transmissions) we’d have no doings. And without doings we’d be at a loss regarding what perceptual prompts had been received. Science can’t undermine any of this, and couldn’t progress without being struck by transmissions from stars or by a print-out of brain activity. We literally catch wonder and fear and inspiration and presence. We live in a world that strikes us this way and that. right science doesn’t take away anything real it just shows us the how, so you can catch them more or less like you catch a ball but not like you “catch” a virus or like one transmits a radio signal or blood transfusion. ah yeah the Whitehead but than that brings us back to the “crypto-spiritual project”. also: can you all add a “reblog” button at Synthetic Zero (or tell me how to do it since I seem not to have figured out how to do it)? thanks! oh sorry, i’m sadly tech-incapable but will ask one of our more savvy members to get on it.